18+. New customers only. Minimum €20 (£15) deposit required. The deposit and bonus amount must be wagered on sports bet with odds at least 1.60 6 times within 30 days. T&Cs apply. 10Bet Sportsbook was launched in 2003 to the immediate embrace of bettors from all around the world. One of their key ingredients for success is availability: the site is accessible in more than 90 countries in seven languages. 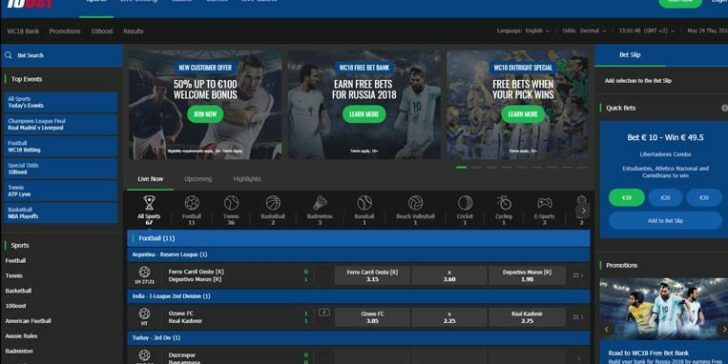 Furthermore, 10Bet Sportsbook has developed their services in a way that appeals to experienced players just as much as newcomers. The latter might find the list of bet-types at 10Bet Sportsbook overwhelming at first glance. On the other hand, the wide range of available bets provides plenty of room for progress. The list of bet-types is accelerated with an even longer list of sports and events on which they can be applied. The most popular events are always pinned to the top of the site for easy access. However, it is always a great idea to browse through the whole selection, as you might find some hidden gems under “specials” for example. Live betting on popular sports is also at the top of the page if you’d like to make a fast and profitable bet. 10Bet Sportsbook’s promotions are not just random deposit bonuses. They are closely related to sports therefore they bring much more to the table. During highly publicized events, there’s always a special promo with great deals or giveaways. Exclusive offers for football, greyhounds, and horse racing can be redeemed on the regular. Overall, the promotions and offers of 10Bet Sportsbook would put some of the more known brands to shame. Should you be in need of quick answer regarding betting, you are welcome to contact 10Bet Sportsbook’s support at [email protected] or +359-24925973. If you like customized promotion and special bets give 10Bet Sportsbook a try. If you want to learn more about the other services of the site, click here to read our latest review about 10Bet Casino! 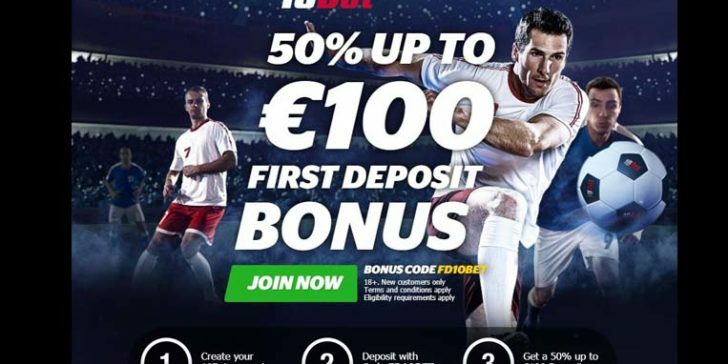 Get Your €30 World Cup Cashback Bonus at 10Bet Sportsbok! Get Your World Cup Free Bet as Well as Your €100 Welcome Bonus Now at 10Bet Sportsbook!